Choosing terrarium plants can be difficult because there are so many amazing options that would look great and thrive in terrariums. The terrarium plants listed here are so easy to grow that even a complete novice can have success. In a closed terrarium, plants almost never need water and will grow happily for years with minimal care. 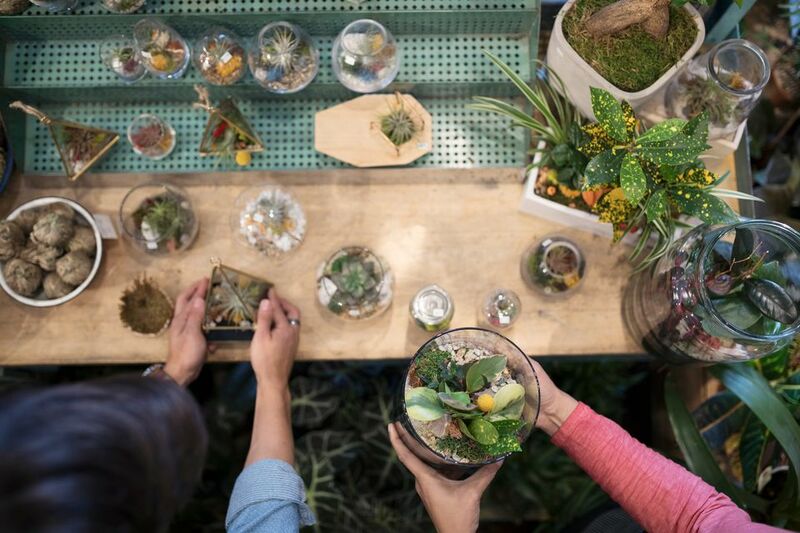 Make sure to buy plants that are small enough to fit into your terrarium jar, preferably without touching the sides. A good way to make sure they'll fit is to bring your jar with you to the nursery or store or bring measurements. Artillery ferns are not actually ferns at all but are members of the Pilea family. They are called artillery ferns because it shoots its seeds with a popping sound—and sometimes quite a distance. Despite that explosive trait, these plants are delicate and have a lovely, interesting texture. Artillery ferns like medium to bright indirect light and a warm humid environment, which is perfect for a terrarium. For that reason, you will find it easy to grow and it should thrive with minimal care. The aluminum plant, a native of Vietnam, likes low to medium light and warm temperatures. The leaves have almost iridescent white markings that really make it shine. This plant grows fairly quickly, so you may have to pinch it back occasionally. Aluminum plant is easy to root as well. Simply take a small cutting and plant it in moist soil. Polka dot plants (hypoestes) seem to have a great sense of humor. This plant is cheerful and comes in pink, red, and silver varieties. Easy to care for, it likes bright, indirect light. It might need to be pinched back if it gets too tall or starts to get spindly or leggy. Red-veined prayer plant (or Maranta leuconeura erythroneura) is a stunning plant. The prayer plant got its name because it folds up its leaves at night, as if in prayer. It prefers medium, indirect light. If it is not getting enough of it, you will know because the leaves will stay folded even during the daytime. Prayer plants like to be warm, so do not keep your terrarium next to a cold window or in a chilly draft. While golden pothos vine may look pedestrian as a houseplant, it can look fabulous in a terrarium. Golden pothos has a well-deserved reputation as a bulletproof, indestructible houseplant, and that it is even truer in the controlled environment of a terrarium. Be careful not to overwater this plant and keep it in bright indirect light. Prune it back regularly so it does not become unruly, and your pothos should look good for years. It is also easy to propagate by rooting the stems in water. There are about 1,000 peperomia cultivars. The common peperomia caperata can either have all green leaves or leaves that are blushed with some red. This slow grower does beautifully in terrariums, preferring low to bright indirect light. Peperomia also sometimes produces cool-looking flower spikes. If you are lucky, these flowers would add a nice color pop to your terrarium. 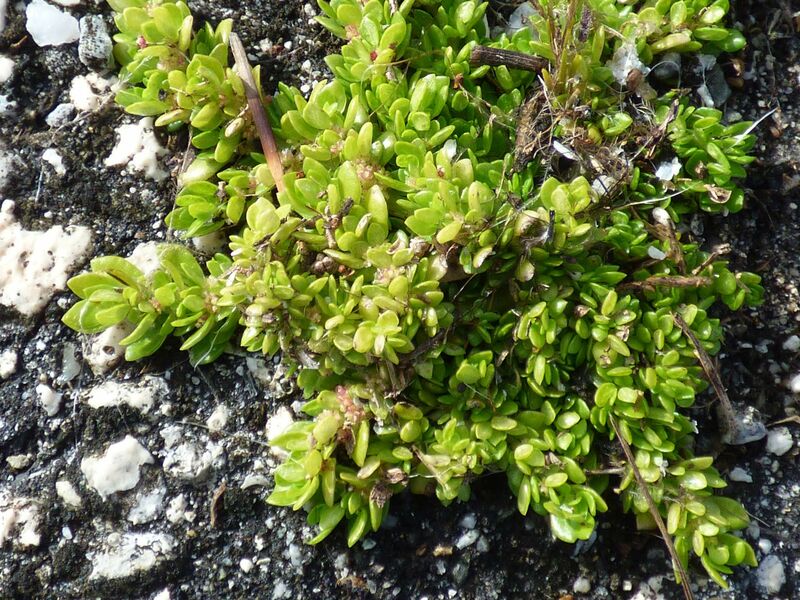 Baby's tears is a small plant with a lot of common names. The plant is also called angel's tears, mind-your-own-business, peace-in-the-home, Pollyanna vine, mother of thousands, and the Corsican's curse. The curse may be referring to the fact that, given the right conditions, baby's tears can be seriously invasive, taking over whole gardens. In a terrarium, it will behave itself quite well and is a lovely, low-growing plant that prefers bright light and consistent moisture. There is something about a small button fern that is terrifically appealing. It is slightly mop-headed, but also kind of delicate and elegant at the same time. Button ferns like bright filtered light and consistently moist conditions, which are perfect for a terrarium. Creeping fig (or Ficus primula), with its small, variegated heart-shaped leaves, makes a lovely addition to almost any terrarium. It is a perennial climbing vine, so you can train it to creep up structures, which could be interesting to try in a large terrarium. This plant prefers bright indirect light but will tolerate shade. You can easily propagate creeping fig by rooting a branch-cutting in water. Crotons can really add bling to your terrariums. Its shiny, thick leaves come in a huge array of amazing colors and shapes. The gold dust croton, for instance, is one of the narrow-leaved varieties that will have various amounts of gold, depending on the cultivar. Crotons like bright light. It is not well known as a terrarium plant but works particularly well when grown in open-jar terrariums.